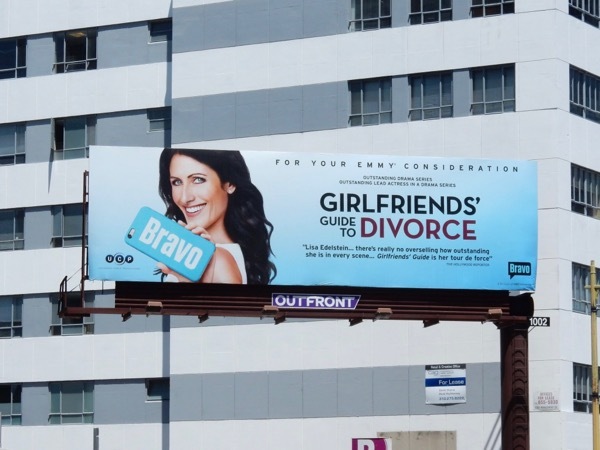 You know the television landscape is changing when Bravo enters the scripted TV arena in addition to its steady diet of reality show programming. 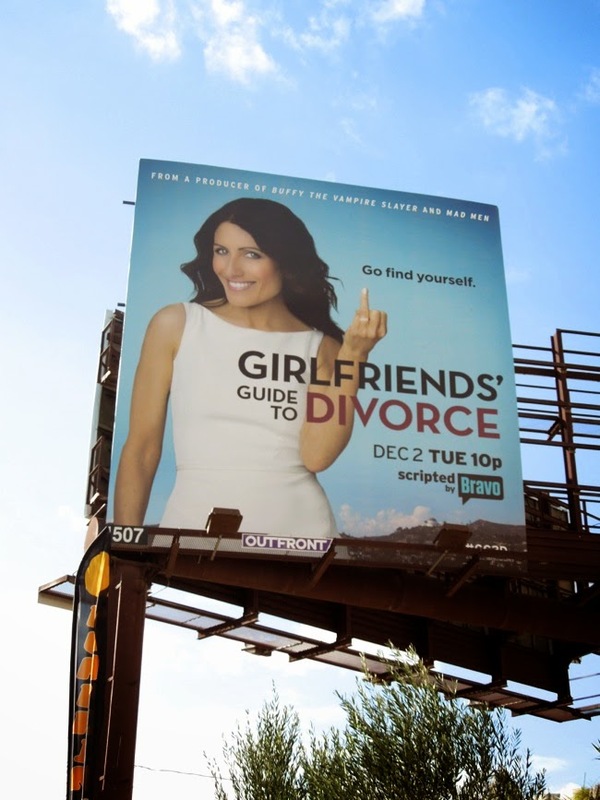 Girlfriends' Guide to Divorce is inspired by Vicki Iovine's book series and premieres this December starring Lisa Edelstein, who you'll recognize from such delights as House M.D., Castle and The Good Wife. The actress stars as 'Abby McCarthy', a recently separated best-selling author of self-help books, secretly hiding her singleton status and the fact that her perfect life is a lie. Having to admit the state of her marriage, the comedy drama follows her exploits as she navigates being a single woman in her 40's in Los Angeles, who finds the advice from her divorced friends leads to a life-changing journey of self discovery along with a few unexpected adventures and mishaps along the way. 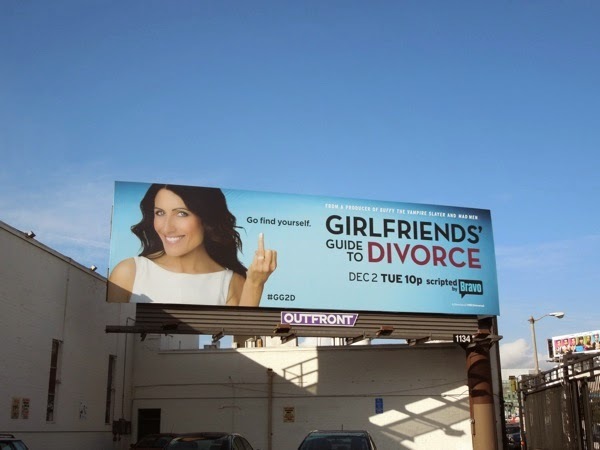 These whimsical Girlfriends' Guide to Divorce outdoor ads were spotted along Beverly Boulevard, La Brea Avenue and the Sunset Strip on November 12, 2014, although these series premiere billboards have caused some controversy with passersby thinking Abby is giving them the finger. 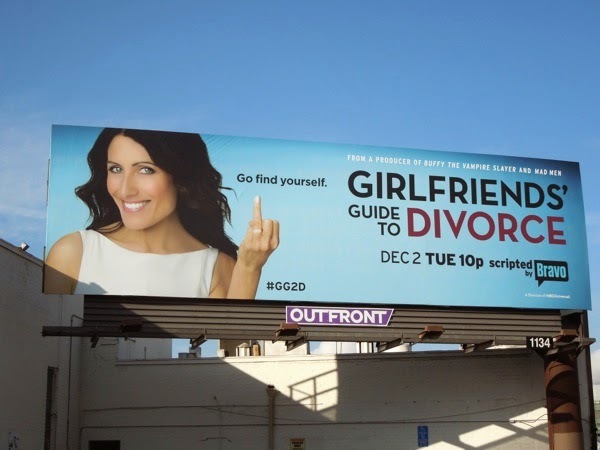 She's merely showing off the missing wedding band on her finger, although the implication is there, especially with the 'Go find yourself' tagline. 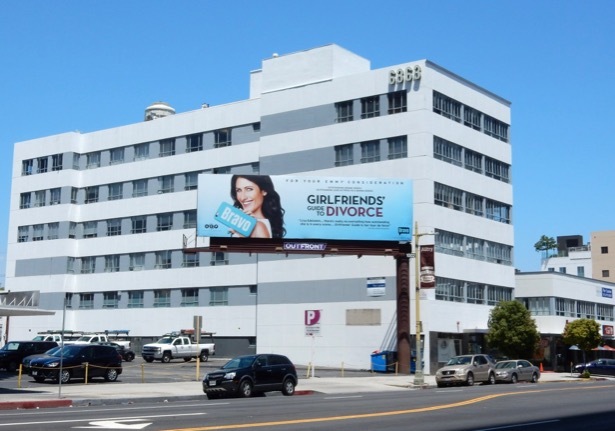 Some people just can't take a joke, and even though the ads may have been allegedly banned on public transportation systems in New York and L.A., it looks like they have still found a home in the skies of the City of Angels. UPDATED: Keeping to the blue theme, here's also an Emmy consideration billboard for the show's rookie season. 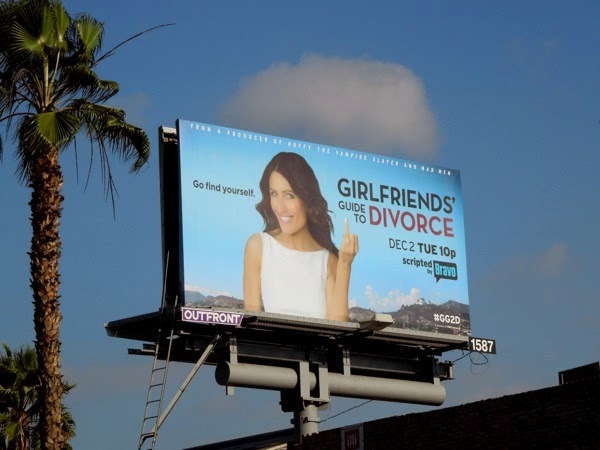 This FYC billboard was spotted along Wilshire Boulevard on June 7, 2015, although sadly the Bravo series was nominated.